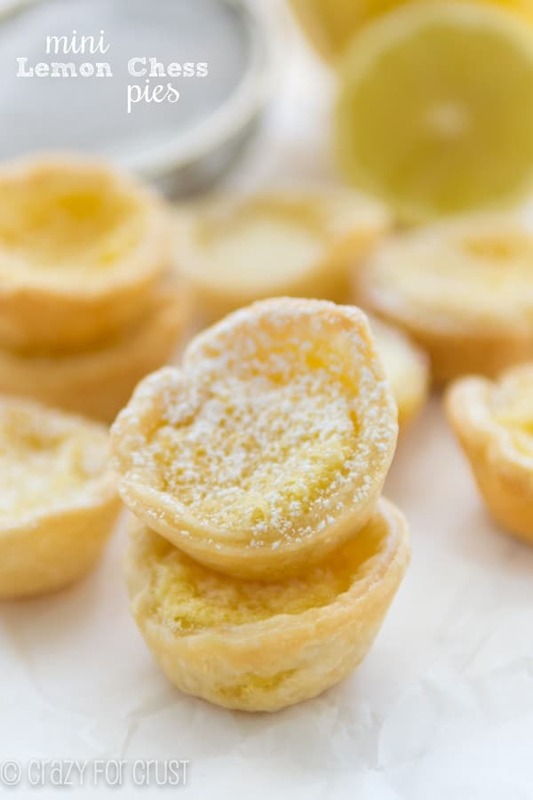 These easy lemon tarts only have 3 ingredients and they’re done in under 30 minutes. 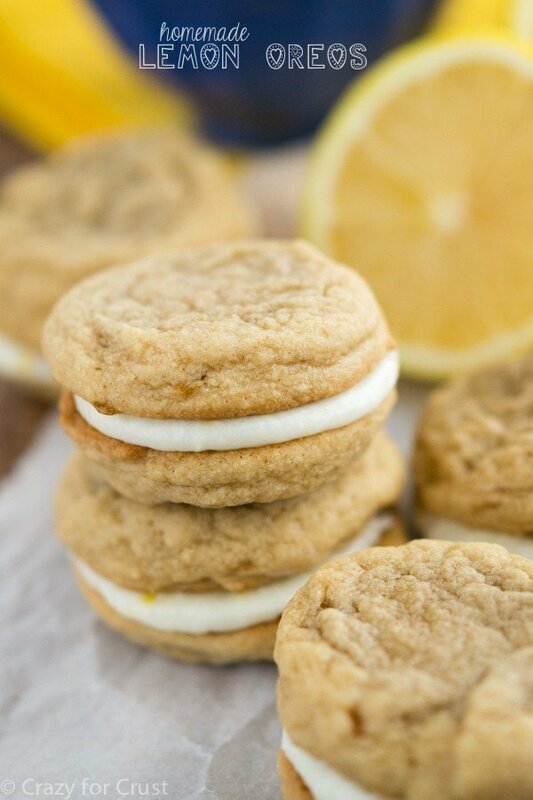 The perfect quick dessert for any party or any time a lemon craving hits. 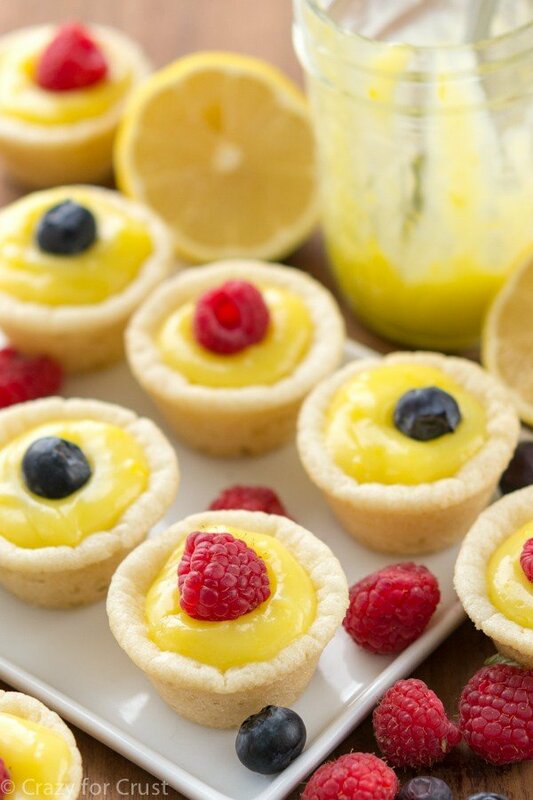 Well hello there, Easy Lemon Tarts. How you doin’? I’m really hoping you read that in your best Joey voice. Man, I miss that show. Never mind. Let’s not worry about numbers. Instead I’m going to wish them a Happy Anniversary and revel in the fact that they still love each other as much now (or more) than they did back then. My parents met each other at my mom’s work. My dad was doing some work in her office and became smitten. But want to know something cool? Their families had known each other for years and they’d probably met as kids, but didn’t know it. Both my grandfathers were firemen, but my mom’s dad (the chief) passed away when she was 5, so after that they didn’t really keep in touch. It’s like their marriage was meant to be. They knew it was meant to be too. After their first date in October they got married the following March. When you know, you know. That fun fact made it easier on them when I started dating Mel and proclaimed he was “The One” 2 weeks later. He didn’t propose for 5 months, but that was just logistics. We’d been talking about marriage since about a month in. My parents made me believe in soul mates, so I think I’m kinda lucky I found mine. Anyway…I thought something as cheery as a 40th anniversary deserved something bright and sunny and happy…like these Easy Lemon Tarts. There is just something about photographing lemon dessert; looking at the pictures just makes me happy! The tart shell is made from sugar cookie dough. I used the Pillsbury break-n-bake sugar cookie dough, the kind that comes in a rectangular package. It made it super easy to just break off a square, roll it into a ball, and press it into my mini muffin pan. You can also use a roll of sugar cookie dough and scoop 1 tablespoon sized balls of dough instead. I used the prepared cookie dough because, as I mentioned last week, I’m super lazy. No mixing, no clean up. That’s my kind of recipe. The second ingredient in these tarts is the lemon, obvi. I originally made these because a friend had given me a bag of lemons. The best way to use up lemons, IMO? Make lemon curd. I can eat that stuff with a spoon, no joke. 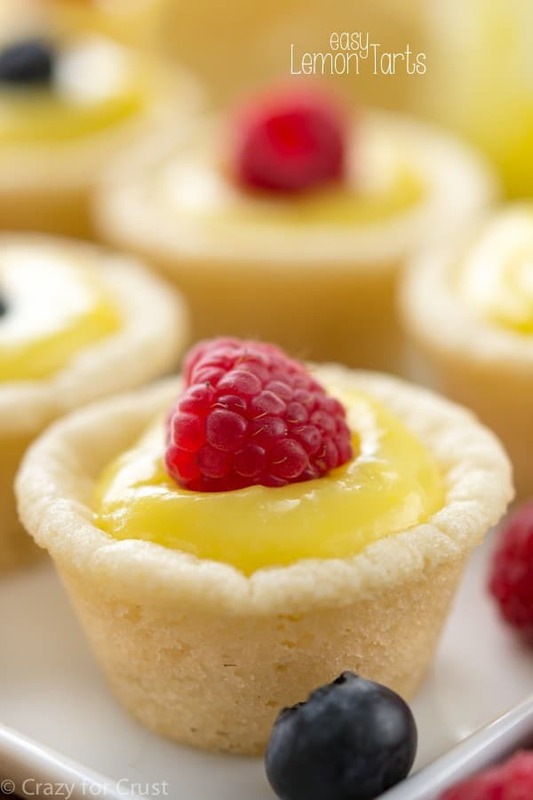 Once the tart shells are baked and cooled, you scoop a healthy scoop of lemon curd into the center. You can use a jarred lemon curd (most grocery stores have it with the jams and jellies) or you can make your own. 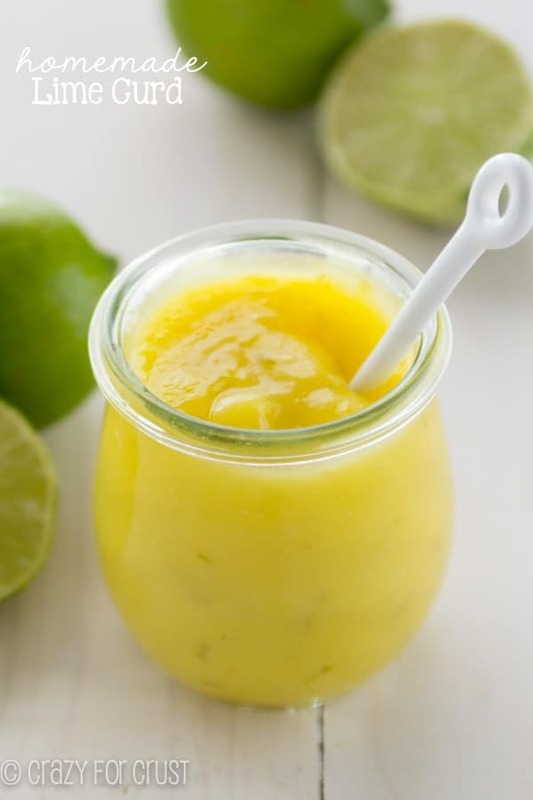 I used my lime curd recipe and substituted lemon zest and lemon juice. It works perfectly. Lemon tarts are one of my favorite things, along with lemon bars, lemon pie, shortbread lemon tarts, lemon limoncello cupcakes, and lemon pudding pound cake. Any and all of them would satisfy a lemon craving in no time at all. 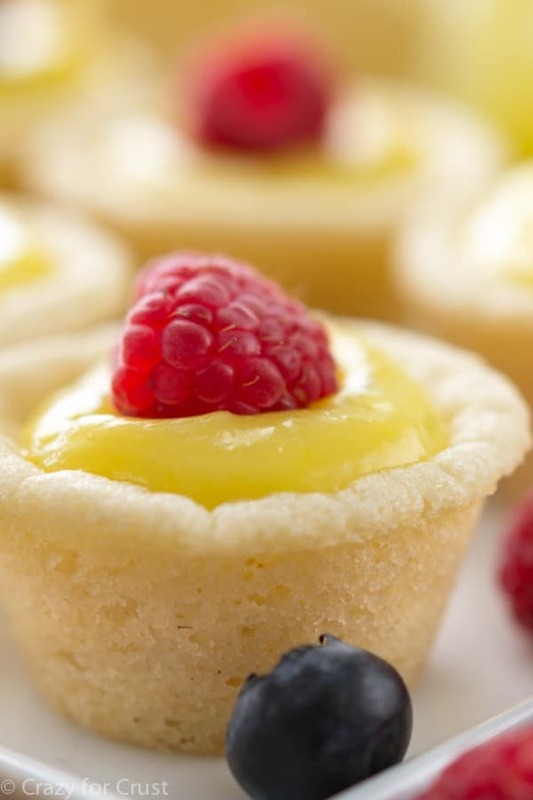 These easy lemon tarts only have 3 ingredients and they're done in under 30 minutes. The perfect quick dessert for any party or any time a lemon craving hits. Preheat oven to 350°F. Spray mini muffin pans with cooking spray that has flour in it. Bake cookie tarts for about 10 minutes, until they just start to turn golden around the edges. Cool, then remove from the pans carefully. They should pop out if you've sprayed the pan well, but using a butter knife to pop them out might help. 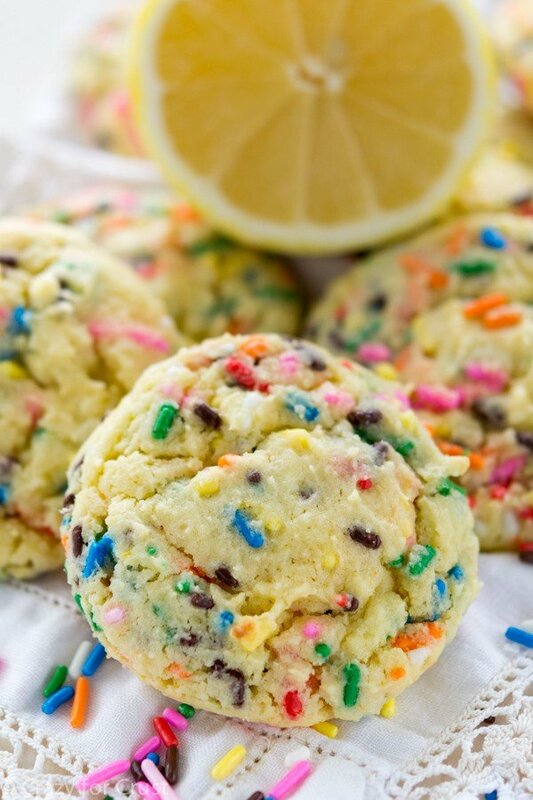 Fill cooled cookies with lemon curd and top with a raspberry, blueberry, or strawberry. Store loosely covered in the refrigerator for up to 3 days. Hi there! Love, love, love this super cute recipe, with the story too;-) It’s soooo darling, and I’m way jealous. My BFF and I made these on a crisp autumn evening, with our good friend white zinfandel of course, and they came out with so much razzmatazz, that it was oozing out of our matching bodysuits. That’s what we typically bake in, I mean sheesh, even our dog was doing non-stop zoomies when we gave her one!!! But, they didn’t last very long, we ate most of them, and through the rest that are neighbor’s window. She’s a real horses behind with an incredibly mossy roof, we’re so bad!!?????. Keep those delicious recipes coming, we just can’t get enough. And those stories, OMG, ummm, more please? Smooches and tickles!!! I just made these and have to say they are SO simple and quick…would post a photo but doesn’t seem to be an option here…no matter…I left the cookie dough (break apart) out a bit too long so was pretty soft…so next time won’t leave it out more than 5 min or so…also did not have the spray recommended so used just a barely there swipe of butter to coat the cups…needs the flour spray as they were a bit greasy on the outside…not much but still. They did for sure come out as easily as stated…mine took about 12 min versus the 10 to start to brown…cooled quickly and I filled with lemon curd…next time will fill with some pudding…this is a GREAT “keep on hand” recipe for coffee/tea get togethers…my only question is can you make the shells and freeze them to have on hand? I give this one 5*’s.. I used my Pampered Chef tart pan (that I bought 20 years ago and have only used it this one time). I baked for much longer than 10 minutes. Took it out after about 13 minutes to add lemon filling and put back in to brown a bit more for another 5 minutes.